On Thursday night, reality star Khloé Kardashian dished on Kendall Jenner’s 21st birthday bash during an appearance on “Jimmy Kimmel Live!" The night before, Kendall celebrated her birthday with family and friends with a dinner at Catch and an after-party at Delilah. During the party, Kendall was gifted with a Rolls-Royce from a complete stranger! “This morning, I was like, ‘Holy crap, do you remember you got this car? How did you get it home?’ and she was like, ‘Oh, my God, I forgot I got a car last night.’ That’s how drunk she was! She was so drunk on her 21st birthday,” Khloé added. Aside from Kendall, Jimmy also asked about Khloé's relationship with Tristan Thompson, who plays for the Cleveland Cavaliers. "I'm in [Cleveland] very often. 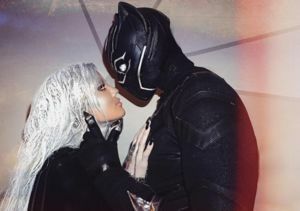 I actually really like it,” Khloé said. "I like just having my routine and being a little more under the radar.” Watch!